Once in a blue moon, the seemingly innocuous field of children’s programming offers up a show so powerful, that even the highest levels of government stop to recognise its positive impact on young minds. Such is the story of Doc McStuffins. Emmy Award-winning writer and producer Chris Nee knew that she was breaking new ground when she created the character of Doc; a six-year-old African American girl who spends her days patching up sick toys, as practice to become a doctor when she grows up. Meanwhile, Doc’s dad is a stay-at-home parent and homemaker, and her mother is a physician. In just three years of existence, Nee’s Disney Junior animation has been screened at the White House, spawned a 3,500-member society of black female doctors, and inspired countless young viewers to view gender, ethnicity, and/or social background as no obstacle to achieving their dreams. Furthermore, 2016 will see a special episode entitled “Doc McStuffins Goes to Washington”, guest starring the First Lady of the United States herself, Michelle Obama, who invites Doc and other kids who are making a difference in their community to the White House to be honoured in a special ceremony. 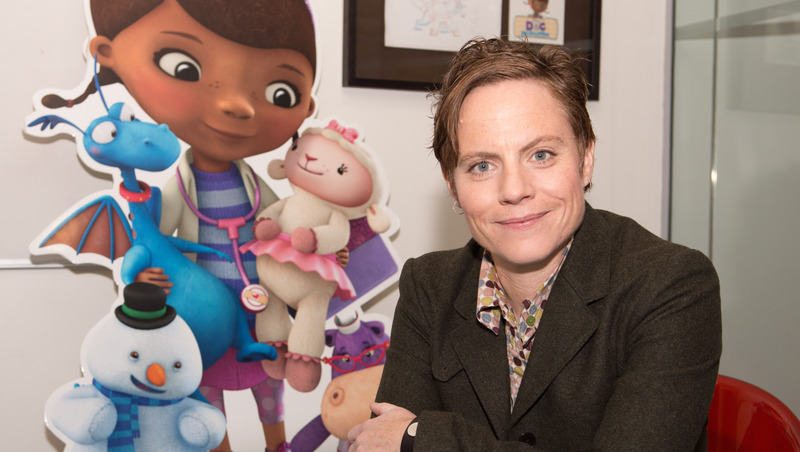 In advance of the show returning to Disney Junior UK for Season 3 on October 7th, I spoke to Chris Nee about the magic of Doc McStuffins, and how children’s television is helping to shape the way future generations see the world. TVDaily: Hi Chris, congratulations on the success of the show! It’s really inspiring to see an animated series which has such a positive role model for its young viewers being received so well. CN: It is amazing. I never imagined that all this would happen! I really think that shows such as yours are helping to shape the world our kids will live in in the future, in terms of representation and acceptance, which is really powerful. Is this something that attracted you to work on children’s TV? Definitely. I’ve always loved the idea of being able to get in early; mould them while they’re young! I had the great privilege of starting my career at Sesame Street, which showed that you could create smart shows that were really going to change the trajectory of a kid’s life, while their parents could still be engaged; that as a writer and creator, you could work in a medium where you could amuse yourself as much as you could in any other age range, while still affecting young minds. I really see that as a privilege. So what were your favourite TV shows that helped to shape you as a kid growing up? Yeah, I mean these were amazing shows! And I’ve ended up working with a lot of those people; a lot of the people who were at the tops of all those shows are actually making the Disney Jr. shows now. So you get to work with the people who made the shows you loved when you were younger? Could you tell us more about Doc McStuffins: Pet Vet? Absolutely. I’m very excited that we’re expanding the clinic. Apparently with that one little plastic unit we’re able to add on wings as long as we care to, which is the wonder of animation! But I’m excited because I think that having and taking care of a pet is such a great learning experience for kids. It teaches them responsibility, and it’s something that was a huge part of my life growing up. I’ve also made sure that my son has a dog, and that he takes care of that dog, and that that’s his responsibility, so I’m really excited that we’re breaking into this world. We’re going to see Doc working as a veterinarian, but we’re also going to see Stuffy getting a new pet, and learning what it is to take care of a creature. And we’ll see that Stuffy’s not always that great at it! So it’s a string of comic disasters until he learns how to do it. But ultimately he loves the pet so much, and that’s the basis that we always go back to. He learns how to step up. Do you think that the show’s clear focus on social issues has helped to attract some of the guest stars you’ve had, such as Jim Belushi, Geena Davis etc.? Yes, there’s definitely no question. I think there are a few things about the show that are bringing in the kind of talent that we’ve gotten, and reasons why people feel very positive and want to be involved in it, because it is breaking new ground. I also think that on a lot of these shows, the guests come in and do five lines, and they’re not really getting to do a full character and story arc. But for us, the guest stars always get to be a main toy, and really go on an emotional journey from beginning to end. So I think we’ve brought in a lot of great people because we can offer them such fun roles. Also, I can’t reveal much in the way of names at this point, but we have some really exciting people coming in Season 3. We can now reveal that Doc and the toys travel to Washington D.C. to meet the First Lady of the United States, Michelle Obama, in a special episode of Doc McStuffins premiering in 2016. Speaking of the voice actors then, I have to ask; where did you find the amazing Kiara Muhammad? She is amazing, isn’t she?! It was her first voiceover job, and it was a long search, because it’s very unusual to have a kid actor as the lead in a series. Usually they get an adult to voice a role like that, because you know you’re going to get the level of professionalism and you know they can work. But I just felt very strongly that one of the keys to the show was that you believed in Doc’s youth, and believed her as a character, so the craziness can work around her. Ultimately it came down to two kids. The other one was a really accomplished Broadway star, around the same age, but Kiara was just so smart, and so fresh, and sounded like a real kid. Thank you for saying that though; no one has ever asked me that before! She is certainly amazing. OK, I have to ask – what’s it like having First Lady Michelle Obama as a vocal fan of the show, and screening the show at the White House? How did that go? It’s mind-blowing, is what it is! It’s just one of those moments that you can’t believe. When you’ve hatched up your own little animated show, you’re just hoping that someone other than your mother is going to watch it. So the day when the phone rings and you pick it up and someone says “Okay, the White House just called”, you’re just like “Oh, come on! In my life, that is not possible!”. But what an incredible day. We went to the White House, we screened an episode for the veterans on Veterans’ Day, Michelle Obama announced it… You just have to pinch yourself. And talking about those ‘wow’ moments, could you tell us more about your involvement with The Artemis Medical Society? The Artemis Medical Society originated with this woman named Dr Myiesha Taylor. She wrote a blog article that was really incredible, right after Doc went on the air, and she talked about growing up as an African American woman who wanted to be a doctor, and how there were zero role models for her. And when she did that, all of these other women started getting in touch with her, and they put together a collage called ‘We Are Doc McStuffins’ with pictures of themselves; all African American, women doctors. So they made this collage, and with that they created the first organisation for black, female doctors. Again, those are the kinds of things that you can’t possibly imagine are going to come out of an animated show that you’ve created. I think that what you’re doing is so important and so positive. Thank you so much for taking the time to speak to us about it. We’re really looking forward to Pet Vet and Season 3! The final episodes of Doc McStuffins Season 2 make their UK premiere on Disney Junior on Monday 5th and Tuesday 6th of October. Season 3 beings with a double-length special episode entitled A Dragon’s Best Friend on Wednesday October 7th. « Zack Snyder in Talks For Watchmen TV Series?